good value, a strong and soft towel. When it comes to dealing with spills and soils, the Tork Premium White Paper Hand Towels Roll is a practical option. Manufactured with this leading brand's expertise, each roll consists of approximately 408 sheets of strong and highly absorbent tissue. This large capacity reduces the need for excessive replenishments while also ensuring that each roll lasts as long as possible. Whether used in the corresponding dispenser or stored aside until required, this hand towels roll pack is an economical option that works for all environments. 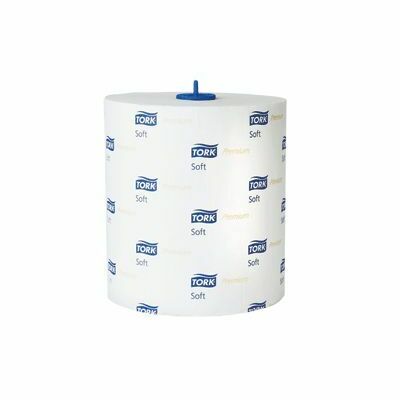 These economic rolls are compatible with the Tork Roll-Type Paper Towel Dispenser H1.